KS20-S Dual Purpose probe designed for monitoring both surface and immersion temperatures. This probe features a 'crossed' ribbon sensor offering superior strength and speed when compared to a single band version. • A robust, entirely waterproof design for Legionella Water Monitoring. Note: This probe is suitable for smooth clean surfaces. If used on an uneven surface there is a risk that the band will be weakened and deformed. Can I use the KS20-S to take temperature of running water in a shower? Whilst the KS20-S is completely waterproof, we would recommend our KM08 Shower Probe which has been specially designed to overcome the problem of temperature loss when taking shower temperatures. What is the life expectancy of the KS20-S? Longevity will depend on a number of factors including frequency of use, environmental conditions and correct application (see 'How do I use the KS20-S to take surface temperature of a water pipe?'). How do I use the KS20-S to take temperature of running water at a tap? Connect the probe to your thermometer as above. Place the end of the probe into the water stream ensuring the water is flowing directly onto the red area at the tip. You will need to hold the probe at a shallow angle to achieve this. Record temperature when reading has stabilised. How do I use the KS20-S to take surface temperature of a water pipe? First, remove the protective cap and plug the probe into your thermometer. 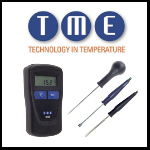 Ensure the thermometer is set to 'K'- type thermocouple. Ensure the pipe surface is smooth and free of dirt or debris. Using only minimal pressure, hold the tip of the probe squarely against the surface. Avoid moving or rotating the probe whilst in contact with the surface and do not apply pressure or force as this may damage the sensor. Record temperature when the reading has stabilised.